The southwest carries an intrigue and inherent beauty that offers all who behold an experience that is unprecedented. Within the southwest resides a circle of majestic, natural creations that attract adventurists and traveling enthusiasts from all areas of the globe who seek an experience that is life-elevating. Such places like Upper and Lower Antelope Canyon, Horseshoe Bend, the Grand Canyon and Monument Valley each offer the soul something profound. Each of these destinations are deeply respected among the The Diné (Navajo). In respect to culture and tradition, Navajo Tours Direct is a family – in a long line of generations prior – who carry forth the responsibility of protecting, preserving and guiding all who visit with careful dialogue that these natural landmarks within the grand circle are a blessing to behold. Navajo Tours Direct firmly sustains this creed of sharing, educating and advocating areas of our homeland in a fashion that is personable, professional and respectable. As a Navajo owned and operated tour company we are firmly grounded in the fundamental principles of hózhó (balance and beauty) in serving all who wish to experience the natural beauty of Diné Bikéyah (Sacred land of the Navajo). Our approach is simple, book a tour with us and you’re guaranteed a treasured experience that will revive your spirits and ease the stress that can often be found in fast-paced living. We are your vested tour guides committed to taking you on an adventure filled with destinations beyond any other. 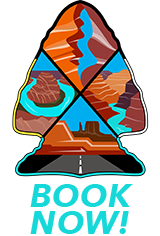 To serve locals and visitors to Arizona with an unprecedented tour of destinations within the majestic grand circle of the Navajo Nation. All visitors ages 5 and up are welcome. Veterans and Senior citizens receive special discounts. Our experienced guides are very keen of each destination, and will help you capture the best angles. Each tour destination will be accompanied with information revered within the Navajo culture. Navajo Tours Direct was created with the sole mission to serve locals and visitors to Arizona with the opportunity to take a breath, relax and experience the beauty of the Grand Circle in a fun, enjoyable and rewarding fashion. Traffic and weather and other unforeseen circumstances can or may effect tour experience.